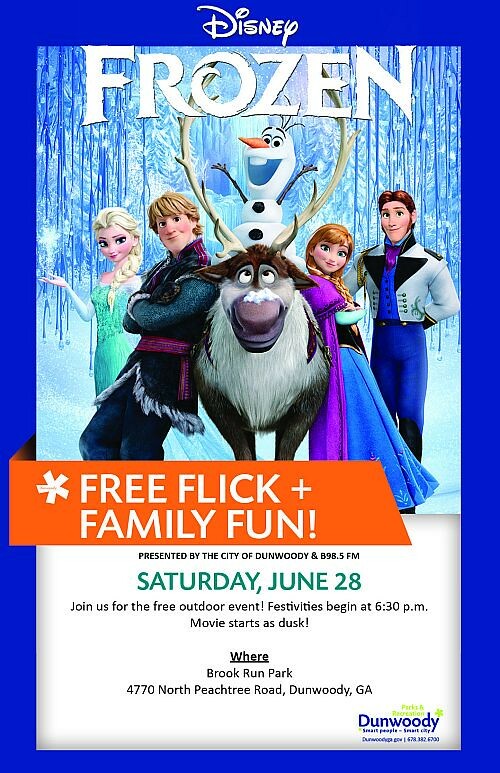 Grab a blanket, some chairs, family and friends and join us for an evening of family fun! Festivities begin at 6 p.m. and the movie begins at sunset. Look for us on the play lawn located near the park's main entrance, next to the playground. We look forward to seeing you there! The evening features Frozen (PG), a Disney animated adventure with fearless optimist Anna (voice of Kristen Bell) who sets off on an epic journey—teaming up with rugged mountain man Kristoff (voice of Jonathan Groff) and his loyal reindeer Sven—to find her sister Elsa (voice of Idina Menzel), whose icy powers have trapped the kingdom of Arendelle in eternal winter...(for those few that don't know). 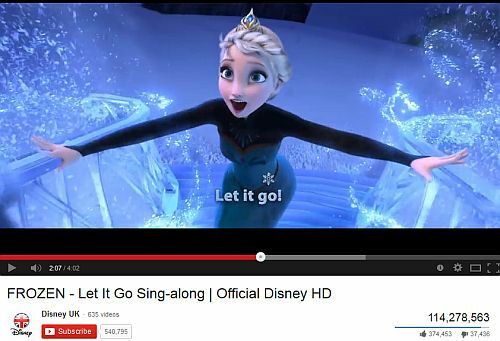 In case there are Fathers of little girls who do not know the words to the Academy Award Winning Best Movie Song "Let it Go" - I thought I would copy the link to the sing along version which has had 114 million views. Who knows maybe the entire park will break out in song? 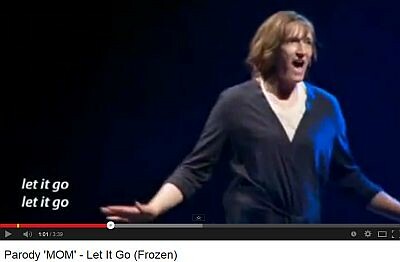 I wouldn't know, I have boys and we can't carry a tune. Experience a thrilling new adventure in the heart of Mother Nature. Feel the adrenaline rush as you climb, jump, zip, and swing from tree to tree at heights up to 55 feet off the ground! Defy gravity with suspension and monkey bridges, Tarzan jumps, flying foxes, and soaring zip-lines — all in the complete confidence and safety of Treetop Quest’s belay system. Estimated opening in mid to late Fall. 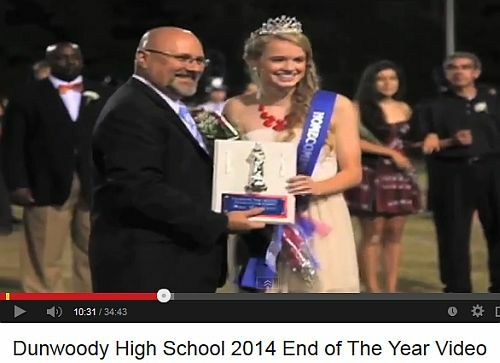 A Year of Dunwoody High School compressed into a 35 minute video. Items of interest for DHS Families. 1. Rising 9th Grade Families, click here to signup for DHSNews. 2. Email dhsfreshmenbridge@gmail.com to register for Freshman Summer Bridge for Rising 9th Grade Students on Thursday, July 31st. 3. Volunteers are needed for back to school breakfast on August 4th. Click here to sign up. 4. Follow Dunwoody Mom at Dunwoody School Daze Blog for all DeKalb / Dunwoody school news. City of Dunwoody conducts crosswalk enforcement to protect pedestrians. On 6/18/14 at approximately 1:30pm, the Dunwoody Police Department conducted a pedestrian crosswalk detail on Mount Vernon Road. The department has received several complaints from citizens in regards to vehicular traffic failing to stop at the designated crosswalk which has multiple safety features in place. During the detail a plain clothes officer utilized the crosswalk twenty-six times, each time the officer activated the flashing yellow lights. As a result of the detail, six citations for O.C.G.A. 40-6-91 Right of Way in Crosswalk were issued. In other words, it’s illegal for drivers to squeeze by, drive around or cut off a pedestrian in a crosswalk, even if there’s room. Forget yield. Remember STOP. 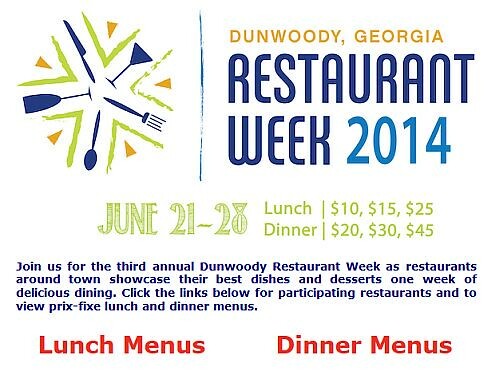 Dunwoody Restaurant Week starts today !! Dunwoody Restaurant Week returns for its third year and is serving up an impressive list of restaurants that will showcase their best dishes and desserts from June 21–28! Set price points and prix-fixe menus allow diners to enjoy lunch for $10, $15, or $25 and dinner for $20, $30, and $45 all week long at over 20 restaurants around town. Whether you have a favorite spot or want to sample something new, please plan to dine around town during Dunwoody Restaurant Week. For more information and to view participating restaurants and menus please visit DunwoodyRestaurantWeek.com and make sure to connect with other Dunwoody foodies and fans on Facebook, Twitter, and Instagram by using the hashtag #DRW14. 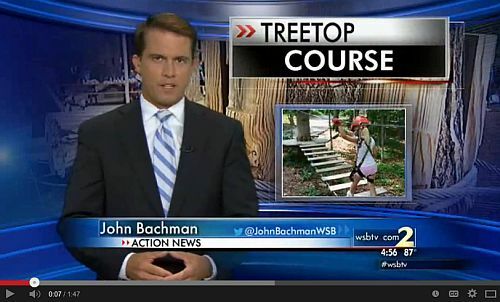 Approval of a Contract with Treetop Quest. Presentation of 2013-2014 Sustainable Student Hero. Ashford Chase Wiffle Ball Tournament Donation. Brother in Blue Award from Chaplain Joe Cirigliano. Approval of Revised Agreement with the Georgia DOT for the PCIDs Bike Plan. Ordinance to Establish the Ad Valorem Tax Rate for 2014. FIRST READ: RZ 14-062: Pursuant to the City of Dunwoody Zoning Ordinance, applicant, HDP Acquisitions, LLC c/o Hotel Development Partners, LLC, seeks permission to rezone property currently zoned Pedestrian Community Conditional (PC-3c) and Local Commercial (C-1) to Commercial-Residential Mixed-Use (CR-1) to allow for a change of previous conditions.The subject property is located at 4681 Ashford Dunwoody Road, Dunwoody, GA 30338. The tax parcel is 18 350 01 015. FIRST READ: SLUP 14-062: Pursuant to the City of Dunwoody Zoning Ordinance, applicant, HDP Acquisitions, LLC c/o Hotel Development Partners, LLC, seeks a Special Land Use Permit for a change in the maximum allowable building height from three-stories to four-stories. The subject property is located at 4681 Ashford Dunwoody Road, Dunwoody, GA 30338. The tax parcel is 18 350 01 015. 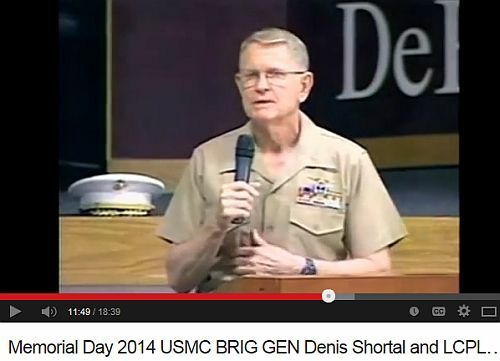 Retired United States Marine Corps Brigadier General Denis Shortal deliverers the keynote address at the 2014 DeKalb County Memorial Day Ceremony. L/Cpl Scott D. Harper, nicknamed "Boots" since high school, age 21, was KIA on October 13, 2011, from Hostile fire/IED while conducting combat operations in Helmand, province, Afghanistan, and serving as part of Operation Enduring Freedom. He was a member of 1st Battalion, 6th Marine Regiment, 2nd Marine Division, II Marine Expeditionary Force, from Camp Lejeune, NC. The First Battalion, 6th Marine Regiment, is currently assigned to Regimental Combat Team 8, 2nd Marine Division (Forward), which heads Task Force Leatherneck. The task force serves as the ground combat element of Regional Command (Southwest) and works in partnership with the Afghanistan National Security Forces to conduct counterinsurgency operations. This was the second deployment for L/Cpl Harper. He had previously deployed with 1st Battalion, 2nd Marine Regiment, 2nd Marine Division in March 2010. Scott was a 2008 graduate from Alexander High School in Winston, (Douglas County) GA, and was active in the ROTC program. He joined the U.S. Marine Corps in September 2008 shortly after graduation from high school. He was promoted to Lance Corporal in November 2009, and was awarded the Good Conduct Medal in September 2011. Scott leaves his wife, Angela Harper, his father, Brian Harper, mother Deborah Busbin Staples, his brother, Mitchell Staples, his sister, Amber Staples, a step-brother, Joseph Hulsey and a step-sister, Holly Harpe. Reprint from The Atlanta Journal-Constitution, Friday, Oct., 21, 2011: They stood outside in blustery weather, tiny American flags clutched in their small hands, to show their respect for a fallen Marine from Douglas County on his final trip home. About 600 students at Winn Elementary School spent an hour or so waiting for a motorcade carrying the body of Marine Lance Cpl. 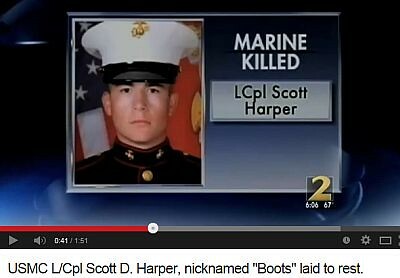 Scott "Boots" Harper to pass on its way to a Douglasville funeral home. Like them, Harper had once attended the Litha Springs school, as a first-grader. Now, he was teaching them a lesson about sacrifice..
Thousands of others joined the students along a 1-mile strip of Bankhead Highway to remember Harper and honor him as the lengthy motorcade made its journey. Standing guard in its own way was the Marine Jr. ROTC honor guard from Lithia Springs High School, which occupied the driveway at Winn. Veterans also turned out to pay tribute to a serviceman who had died on the battlefield. Scott was buried on October 23, 2011 at Ephesus Baptist Church Cemetery in Winston, Georgia. PS: Tomorrow is Flag Day, please fly it proudly & if you happen to have 20, fly them too. 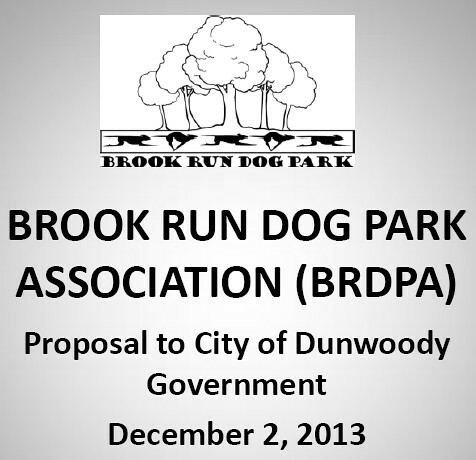 Future of Brook Run Dog Park - public comments and Dunwoody City Council discussion. June 9, 2014 Agenda Item & Documentation presented to Council. Invitation to Bid - New Dog Park Construction documents. New Dog Park Construction documents. No definitive answer on Dog Park status - staff requested to again look at options on park. 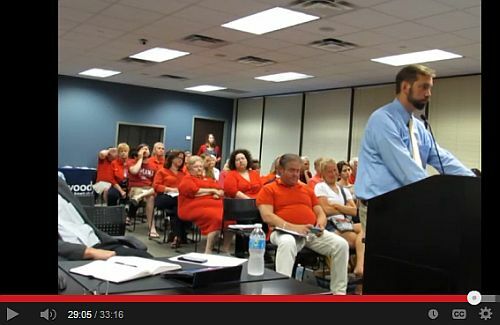 At Monday nights Dunwoody City Council meeting there were numerous important items on the agenda to discuss but the room was filled primarily with supporters from the dog park. Public comment was lively with several speakers including a Boy Scout asking that it not be moved. I have been working for a compromise to keep the dog park in place and I believe the Dog Park Association submitted a great stating point in their proposal which is shown below. If in the end, a compromise is reached where no one is completely happy with the final result, but the park can stay in the same general area; I believe it will be a win / win for the community. Having been involved with the dog park issue for quite some time, I decided that my public statement should not be focused on the misdirected funds, the flawed bid process or the proposal being offered by staff; instead I went with the feelings and emotions of joy I witness by those who use the park on a regular basis. It is my belief that if the dog park was moved to an inferior location that the community that has formed there would no longer exist. What is the Brook Run Dog Park and why it is so special? About ten years ago, a group of like-minded volunteers gathered together with a purpose of having a special place of their own. Much like the current City of Dunwoody, they worked the political system; they set up a non-profit organization, staked out boundaries and toiled for many hours to put into place what is now an extraordinary social center for man and beast alike. The Brook Run Dog Park is primarily a playground for pets, but more importantly, it is a social center for people and I disagree with the plan for moving it because in doing so I believe it will kill that community. The current dog park is shaded and cool which allows friendships time to flourish. It has a gravel-walking path, which allows exercise for animals and owners alike. This is not a dog park, it is a people park, it is a social center, a senior center, and has been the birthplace of many marriages. The new location will not have the same amenities (namely the shade), therefore for it will not have the same draw; and the community will no longer flourish as it currently does. 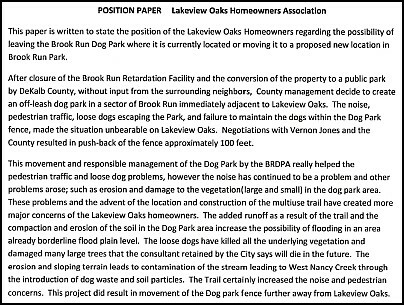 In December, the Brook Run Dog Park Association put forward a compromise plan, which I believe has merit both in cost and in total scope as being the best plan to move forward to keep this community together, lower the noise and mitigate any supposed environmental damages. I will be voting against moving the dog park and recommend that we revisit the plan presented by the Dog Park Association as it has a lower overall cost but more importantly I believe it is the right thing to do. I am here to build communities – not kill them. Increase front end of park to be used for small dogs, less congestion, less noise. Water Runoff improvement efforts based on terracing, slowing and directing water. No park rotation of facilities as no growing ground cover intended. 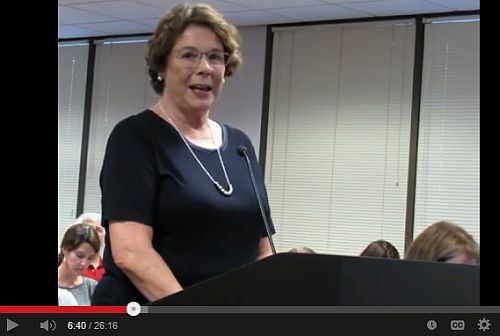 City of Dunwoody requested to pay for all improvements. 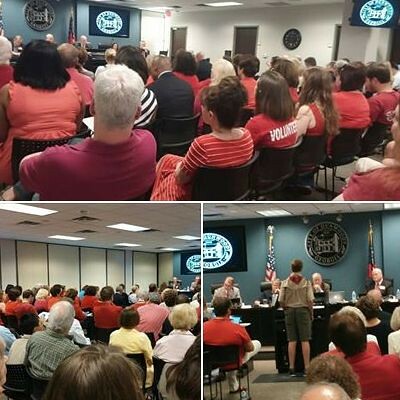 The meeting requested by the BRDPA took place on Mon Dec 2nd at 4 pm at the office of the Dunwoody Homeowners Association and lasted close to two hours. Video was shot but the resolution was set very high therefore conversion and posting will be done as time permits. Dunwoody, Ga. June 10, 2014 – The City of Dunwoody is currently engaged in several beneficial and exciting infrastructure projects in different phases of active development and construction. Perimeter Center Pl. Perimeter Center W. Meadow Lane Rd. 1911 Mill, Patch And Overlay 2.5"
Chamblee Dunwoody Rd. Cambridge Dr. Valley View Dr. 3277 Mill, Patch And Overlay 1.5"
Chamblee Dunwoody Rd. Valley View Rd. Womack Rd 2215 Mill, Patch And Overlay 2"
Chamblee Dunwoody Rd. Womack Rd. Roberts Dr. 3997 Mill, Patch And Overlay 2"
Center Dr. Chamblee Dunwoody End 561 Mill, Patch And Overlay 2"
Dunwoody Village Pkwy Chamblee Dunwoody Rd. South End 450 Mill, Patch And Overlay 2"
Mount Vernon Rd. Ashford Dunwoody Rd. Chamblee Dunwoody 1450 Mill, Patch And Overlay 2.5"
Mount Vernon Rd. Chamblee Dunwoody Vernon Oaks Dr. 4143 Mill, Patch And Overlay 1.5"
Nandina Ln. Chamblee Dunwoody Mount Vernon Rd. 636 Mill, Patch And Overlay 2"
Dunwoody is coordinating the paving of the following streets in conjunction with a water main replacement project by DeKalb County on Mount Vernon Road and Chamblee Dunwoody Road. Due to the timing of the water main replacement project, Mount Vernon Road, Chamblee Dunwoody Road and the side streets listed above will likely be paved in the spring of 2015 following the completion of the utility work. Since 2009, the City has invested over $5,000,000 in repaving its roads. Each year, approximately 70 percent of the funding is directed towards high traffic volume roads. The remaining 30 percent is applied to the lowest rated neighborhood streets based on the pavement condition assessment. Since 2009 the City has made significant improvement in the condition of its main thoroughfares with the percentage in good to excellent condition increasing from 45 percent to 60 percent. On May 17, the city celebrated the grand opening of the new Georgetown Park. The opening of the city’s newest park was attended by more than 200 visitors who were treated to games, food truck cuisine, a bounce house, fair hair, face painting and the live music from two Dunwoody-based bands, Missing Cat and Array. Mayor and City Council members were on hand to cut the ribbon at the new park and community members of all ages visited the park square, pavilion area, children’s playground, and strolled along the Dunwoody Trailway within the park linking the pavilion area and playground. Numerous trees, flowering shrubs, and water-saving grasses have been installed and new amenities, including new decorative street lights, benches, and garbage receptacles, are in place for visitors use and enjoyment. Decorative brick work and special lighting create a visual and aural ambiance along the fountain area and the two new bocce ball courts off the Georgetown Park pavilion area are ready for games and play. 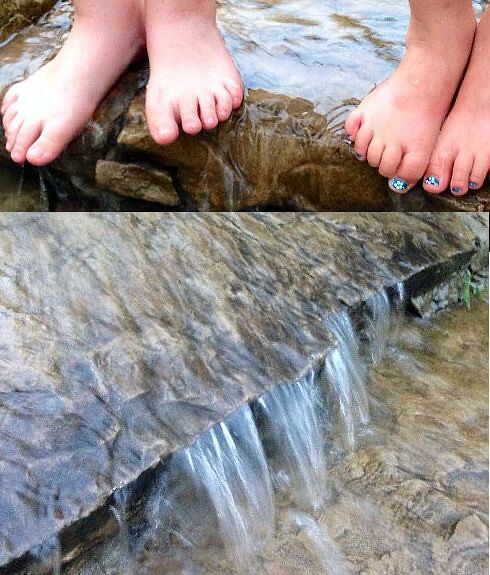 The city welcomes everyone to come out and enjoy everything Georgetown Park has to offer. Work on the latest segment of the Brook Run Park multi-use trail is about 75 percent complete. Weather permitting, the city anticipates construction crews will finish the 1.3 mile addition to the multi-use trail at Brook Run Park by the end of July. The city and its arborist carefully planned the trail’s centerline placement to help reduce the overall number of impacted trees. Over the past month crews have poured concrete for the remaining segments of the 12-foot wide multi-use trail and will soon begin preparations for the installation of decorative benches and waste/recycling receptacles along the trail route for beautification and convenience. City inspectors continue close monitoring of all construction activity and work to ensure compliance with Georgia Environmental Protection Division requirements regarding erosion and sediment control. The latest phase of the 12-foot wide multi-use trail will help open access to areas of the park which often are not frequented by park visitors. The new trail section also will connect with the existing 0.7 mile trail to create a two mile, 12-foot wide concrete multi-use trail loop within Brook Run Park. As future phases are completed in the coming years, the Dunwoody Trailway will run from Brook Run Park to Chamblee Dunwoody Road and will cover 3.3 total miles. Visitors to the Dunwoody Nature Center will be pleasantly surprised at the progress being made in the construction of the expanded classroom space and the public restroom facility. These two new additions are expected to be complete in late June. By expanding the facility’s classroom space, camp attendees and program participants will take part in an enhanced visitor experience. Once the deck is complete, guests attending lectures, classes, programs and special events will be able to enjoy the new deck overlooking the restored meadow. In addition, the new restroom facility, which will be available to the public at all times during park hours, will help the Nature Center accommodate larger crowds and better facilitate frequent high volume traffic such as school field trips of 100+ visitors during the fall and spring. The old, unused two single-story buildings, just south of the Veteran’s Memorial and Children’s Playground area situated near the front of Brook Run Park, are in the final stages of being demolished. The buildings have been torn down to create space for the potential future development of additional park amenities. The origination of these new amenities comes from the Parks and Open Space Master Plan which included using the space for restroom facilities, sand volleyball, tennis and basketball courts. During the demolition process, the contractor discovered the presence of asbestos materials in the foundation. Demolition crews promptly worked with city staff to remove the asbestos-contaminated materials and clean the exposed area pursuant to the Environmental Protection Agency’s strict guidelines. The demolition is expected to be complete in time for the opening of the latest section of the Brook Run Trail. Construction crews continue to make progress on the Dunwoody Village Main Street project. The new stormwater drains along the south side of the thoroughfare are now complete and crews will be finishing up curbing and driveway entrances on the south side over the next two weeks. This will be followed by paving work on the south side. After completion of the south side paving, crews will then shift to commence work on the north side, moving traffic to the south side of the thoroughfare. The timing of the traffic signals at either end of the parkway (at both Chamblee Dunwoody Road and at Mount Vernon Road) has been adjusted to fixed cycles until the construction is completed. Once work at these intersections is complete, the signals will be re-set to operate via the inductive-loop traffic detector sensors typically installed at signalized intersections. The shops, restaurants, and businesses located in the Village Parkway area will remain accessible throughout construction. The city worked closely with the businesses in Dunwoody Village and continues to conduct proactive outreach and communication on the project. Main Street project information materials, including a store front project poster and point of sale flyers to display adjacent to registers, are available free of charge for Village businesses by contacting Bob Mullen at 678-382-6881 or bob.mullen@dunwoodyga.gov . For additional information regarding the Main Street project please contact Michael Smith, Public Works Director, at 678-382-6850 or email michael.smith@dunwoodyga.gov . The city held a Public Information Open House Meeting on June 5 to discuss the proposed pedestrian and bicycle improvements along Chamblee Dunwoody Road. More than 50 residents and community members attended the meeting to find out more information on the project, ask questions and better understand the planned improvements. The Chamblee Dunwoody Road corridor lacks on-street bicycle lanes and the sidewalk is only available on the west side of the road beginning at Valley View Road and continuing to Womack Road. The proposed pedestrian and bicycle improvements along Chamblee Dunwoody Road aim to remedy these deficiencies by widening the road to accommodate bicycle lanes in both directions and a sidewalk on the east side of the road. As outlined by the City of Dunwoody's Comprehensive Transportation Plan, the city has adopted a "Complete Streets" policy, which outlines the need for choice, connectivity, and community by providing access for all transportations including pedestrians, cyclists, transit riders, as well as cars along major routes through the city. The primary goal of this project is to connect the city’s residential areas to the commercial and municipal amenities that are offered. However, a secondary result will be improving the visibility to the south for westbound drivers on Womack Road. Opening up the sidewalk at this intersection will allow the city to remove the right turn on red restriction on Womack. Where we are able, the city strives will make such improvements in conjunction with other capital improvement projects. These improvements will be done in conjunction with the proposed replacement of DeKalb County's water main and the city's scheduled resurfacing of Chamblee Dunwoody Road. 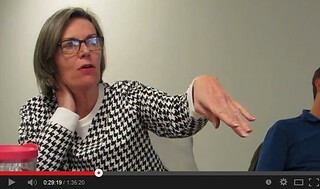 Questions and concerns may be sent to Mindy Sanders at mindy.sanders@dunwoodyga.gov. Ken Scott has entertained numerous children in the Heneghan home. Kristin and I host an annual Halloween Party and for the last several years we have used Entertainer Ken Scott to put on a show for the children in attendance. Ken is a the 3 time winner of the Atlanta Magician of the Year Award and I highly recommend him for all types of children's entrainment. I noticed that the Friends of the Dunwoody Library will be having Ken come in to perform on Monday and if you have little ones I consider it a don't miss event. Funding provided by the Friends of the Dunwoody Library. Discussion of Amendment to Chapter 20, §20-66 Flags. SECOND READ: Amendment to Chapter 4, Alcoholic Beverages. Resolution Appointing CVBD District 3 Board Member. Appointing a new Municipal Court Judge and Administering the Oaths of Office. 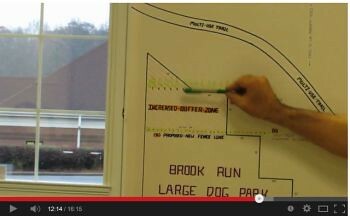 Discussion of Contract Award ITB 14-06 Brook Run Park Dog Park Construction. PUBLIC HEARING & First Read - Ordinance to Establish the Ad Valorem Tax Rate for 2014. C. Adeimy, on behalf of NitNeil Partners, LLC, seeks permission to rezone property currently zoned Office-Institution Conditional (O-Ic) to Office-Distribution (OD) to allow for a change of previously approved use. The subject property is located at 1274 Crown Pointe Parkway, Dunwoody, GA 30338. The tax parcel is 18 349 01 003. Acquisitions, LLC c/o Hotel Development Partners, LLC, seeks a Special Land Use Permit for a change in the maximum allowable building height from three-stories to four-stories. The subject property is located at 4681 Ashford Dunwoody Road, Dunwoody, GA 30338. The tax parcel is 18 350 01 015. Discussion of Revised Agreement with the Georgia DOT for the PCIDs Bike Plan. Discussion of Pedestrian Safety Study. 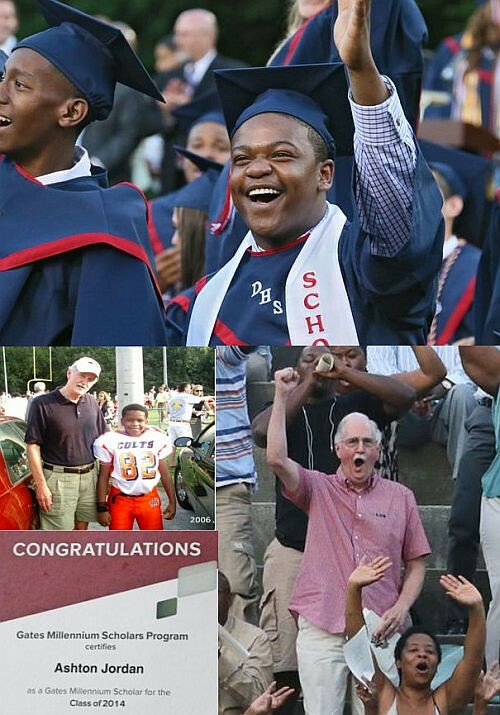 Best story of the year for AJC, tells of Dunwoody High School Gates Scholar, Ashton Jordon and his long time mentor Mr. Art Collins. Since Ashton Jordon was 6 years old, Mr. Art Collins has been his mentor and has had lunch with him every week and still does. Ashton, a troubled child, barely spoke when he was in the first grade at Chesnut Charter Elementary School when Mr. Collins came into his life. But Collins didn't give up and this 70-year-old grandfather went to Ashton's school for lunch week after week. Last week Ashton graduated from Dunwoody High School the recipient of the Gates Millennium Scholarship for a full ride education to Elon University, a highly ranked, private liberal arts college in central North Carolina. The AJC article linked above (but possibly behind the pay wall) is a wonderful story of love determination and success. Congratulations Ashton and Mr. Collins, I am mighty proud of you too.